Four Coptic churches in Upper Egypt were closed down last weekend by local authorities seeking to ease tensions between Muslim and Christian villagers. Three of the churches were in Minya governorate, just south of Cairo, and the fourth in Sohag, further south. In the Minya village of Ezbet al-Qeshiri, the church was shut by police after Muslim villagers set fire to the church’s iron gate and attempted to break into the building, according to Coptic news site Watani. Watani reports that around 60 Muslims chanted, “No matter what, we’ll bring the church down”, and “Islamic! Islamic!” – meaning they wanted the village to be entirely Islamic. Three Copts were injured as the mob threw stones at houses and smashed a car. Watani says police shut the church to restore order in the village. 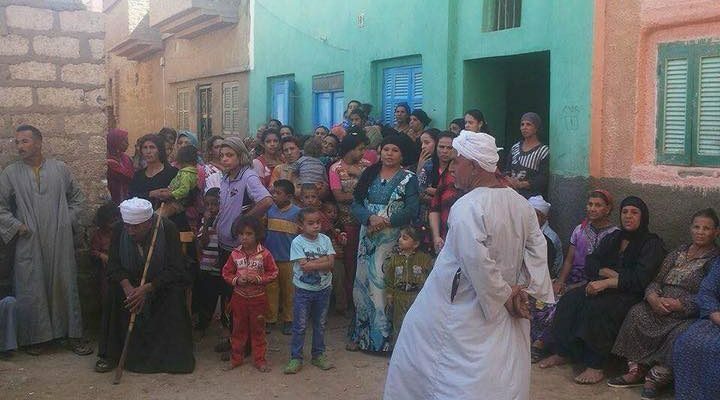 A local Copt told Watani the village is home to about a thousand Copts, who used to pray in a nearby village until 2015, when the Minya Bishopric bought a building for them in Ezbet al-Qeshiri. The first floor of the building is used as a reception hall and nursery, the second floor is the church. Elsewhere in Minya, the church in al-Karm was closed following complaints by local Muslims who, seeing cement and mortar arrive at the church, believed the Copts intended to extend their church building. In fact, Watani reports that the supplies were intended to repair the church floor. In Sohag, in the village of al-Hager, the church had its electricity and water supply cut by police (see video below), who said they had received complaints from Muslim villagers. The fourth closed church was in Sheikh Alaa’, also in Minya. All four churches were built without licenses, but each applied for legal status following the introduction of the Law for Building and Restoration of Churches, brought in in 2016. Egypt has pledged to move to legalise unlicensed churches following the adoption in August last year of the law governing the construction and renovation of churches, a contentious issue for both the country’s Christian minority and Islamists. Christian MPs, rights workers and researchers condemned the proposed law as an attempt to pacify Christians in the name of public order, while not effecting real change. The Coptic Orthodox Church also protested, calling the law “a danger to Egypt’s national unity” because it did not remove certain restrictions and therefore did not “consider Egyptian Christian citizens’ equal rights”. In preparation for a cabinet meeting on the issue, the Church collected 2,650 requests from parishes waiting for a permit or license to renovate or build. According to church sources, Coptic Pope Tawadros II “was keen to set up a permanent church committee to examine the cases [of churches applying for permits]”. It was hoped the new bill will remove a host of hurdles which often make building a church impossible.